The Atlantic Road is located between the cities Molde and Kristiansund. It you go by car you have to follow the road named Rv 64. 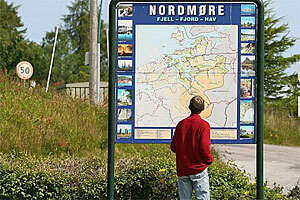 From Kristiansund you drive trough The Atlantic Tunnel to Averøya and then follow the signs towards Molde. The signs to The Atlantic Road shows in Norwegian: "Atlanterhavsvegen"
You can contact the tourist information in any Norwegian town to get more detailed travel information. If you want to visit The Atlantic Road you can also travel by plane. There are good connections to the two nearby cities Molde (MOL) and Kristiansund (KSU). There you can rent a car or travel by bus. You also can combine a tour with the coastal steamer Hurtigruten. They arrange popular excursions on The Atlantic Road. You just leave the Hurtigrute in Kristiansund and catch up again in Molde. There are no railway in connection with The Atlantic Road. Back in early 1921 there where plans that described a railway where The Atlantic Road is located today. You can still go by train either to Åndalsnes with the spectacular Raumabanen and then go by bus, or you can travel with the train to Oppdal with the Dovrebanen and then take bus to Kristiansund. If you travel from Trondheim there are another alternative with the boat service called Kystekspressen wich is a boat that brings you from Trondheim to Kristiansund (takes about 3 hours).